Home Decor and Tech Merging Perfectly. MirroCool has been listed on many news publications, blogs and ecommerce marketplaces as one of the coolest new smart home products around. Most recently, our smart mirror has made a special appearance on GadgetFlow, an online platform that helps subscribers to discover gifts and gadgets that cater to their personal interests. Why does this matter to you, you ask? 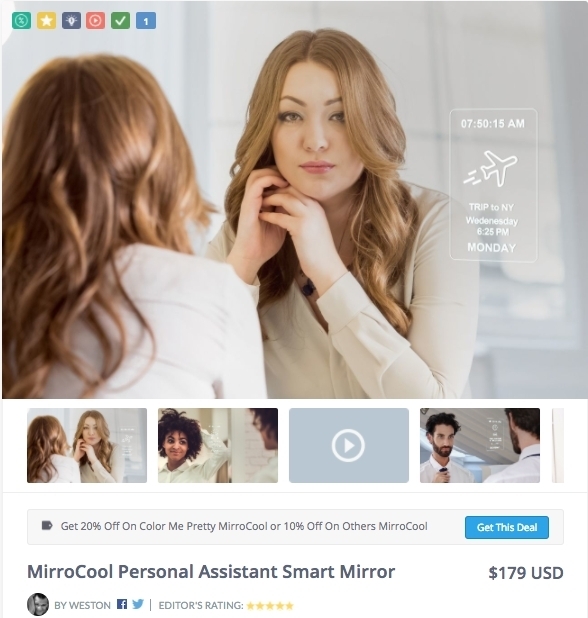 Get 20% Off On Color Me Pretty MirroCool or 10% Off On Others MirroCool smart mirrors. Such a deal. GadgetFlow users will receive an exclusive discount on MirroCool, obtaining 20% off our “Color Me Pretty,” including: your choice of MirroCool smart mirror with a moisturize and water-resistant, aluminum 1.5cm frame in any color of your choice, plus 5GB of MirroCloud storage. The pledge level itself offers savings of $120, but GadgetFlow supporters will receive an additional 20% off and 10% off all other MirroCool pledge levels. MirroCool is the newest smart home product that fits seamlessly into the design of every home - your visitors won’t even know it’s a smart mirror until you show them! Ensure you pick a mirror with style and functionality when you purchase our product. We look forward to seeing MirroCool in your upcoming home decor photos, hearing about your favorite functionalities when it comes to productivity and seeing those selfies you’ve snapped on Instagram! Be sure that you do not miss our awesome MirroCool promotions when you support our Kickstarter through GadgetFlow today. Read the article and get the special discounts here.